If the lashings of pumpkin-inspired food, meringue ghosts, zombie gingerbread men, and the traditional Reeves Jack-o-Lantern weren’t enough, then it was the glint of fear in Lucy’s eyes that could only mean one thing. It was time for the 3rd annual Monday Night Film Club Demon-ocracy. On a Wednesday. So, I suppose this would be the first Thursday review. On a Sunday. Yup. The confusing timeline of all this is actually very fitting, considering the film which won this year’s vote. With cross-generation ghostly menace, Jack Nicholson’s fall into homicidal chaos, Tony the Talking Finger, and the Escher-like labyrinthine Overlook hotel; we all huddled together in the gloom to watch The Shining. The Shining is a 1980 film directed by Stanley Kubrick. This is the second time this director has made an appearance in the MNFC back catalogue, following the Fritzy screening of 2001: A Space Odyssey. The fascists contemplated his directorial style during our chin-stroking, and in particular his use of slow and paced dialogue, large expanses and grand subject matter. In the case of this last point, in The Shining he has managed to create a richly layered and epic feeling to a small cast in a claustrophobic environment, and what is in essence a simple ghost story (at least, as far as the screenplay is concerned, I am yet to read Steven King’s novel on which the film is based). Whilst reviewing many of the hundreds of articles and essays regarding The Shining, Kubrick’s unique style and influence is often considered. It seems true that he often veers between two main extremes of acting: a numbed or blank mode (e.g. the astronauts in 2001) and an exaggerated or frantic style such as in Dr Strangelove or A Clockwork Orange. In his recently published BFI book, Roger Luckhurst considers this further, and uses the encounter between Grady (stony and sedate) and Jack (fraught and increasingly unhinged) in the hotel bathroom to demonstrate a clash of these styles to create a very unbalanced feeling. There are other ways in which Kubrick does this in his handling of the characters and the Overlook Hotel itself, often in a subconscious level; more on this later. The IMDB synopsis neatly recounts the premise. A family heads to the isolated Overlook Hotel for the winter where an evil and spiritual presence influences the father into violence, while his psychic son sees horrific forebodings from the past and of the future. It is established very early on in the film, that there have been horrific incidents at this hotel, including the violent murder of a woman and her two girls by the previous caretaker, and even harking back to the violent battles with Native Americans when the hotel was first built on their burial ground. This last historical point is particularly pertinent. When the film first came out, it was heralded by an advertising campaign whereby bright yellow posters were put up, announcing the arrival of “the wave of terror that swept across America”. Some critics suggest the film is actually fundamentally about racism and America’s closet history of genocide, slavery, and imperialism; and argue it is a metaphor for America’s treatment of Native Americans and, to a lesser extent, African Americans. This is the true wave of terror that swept across the continent. In 1987, Bill Blakemore of The San Francisco Chronicle wrote, “Kubrick is examining in this movie not only the duplicity of individuals, but of whole societies that manage to commit atrocities and then carry on as though nothing were wrong. That’s why there have been so many murders over the years at the Overlook; man keeps killing his own family and forgetting about it, and then doing it again.” This viewpoint is echoed on a documentary exploring the Shining, entitled Room 237. It is well worth a watch and is currently available on YouTube here. On it’s release, The Shining was not a commercial or critical success. As such, it may seem strange that it is now viewed as a masterpiece. Many people have written about why it was initially not well received; and their conclusions are multi-factorial, including high expectations on Kubrick following a 5-year absence. Furthermore, the film didn’t seem to fit into the socio-political reasoning of the day, coming before Reagan and the 1980’s feelings of damaging patriarchy, American consumerism and the threat of capitalism. There also was a sense that many aspects of the film had been ‘done before’ and that it has no originality. It is only with retrospect perhaps that we can see innovation and excellence. After all, Van Gogh was not popular in his day. 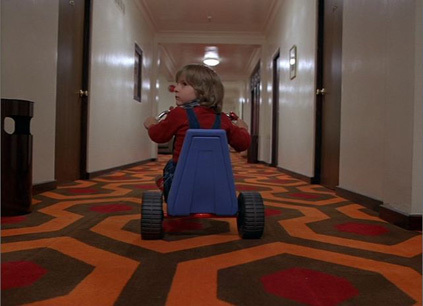 In terms of it’s context in film history, The Shining did indeed come at the midpoint of a wave of “New Horror”: auteur films that were influenced by films such as Psycho and Rosemary’s Baby. It came after a decade of horror genre re-birth, which had already extensively dealt with subjects such as occult, domestic and psychical evil; all these strands had been combined in the Amityville Horror in the previous year. The fear of wayward youth and even the tricycle itself had been used in The Omen (1976). It came out at the same time as Friday the 13th and other main studio horrors, and also the cult movie back-lash to this (e.g. Night of the Living Dead). It was The Evil Dead (1981) that came out shortly after, which was the film that was hailed as groundbreaking, with its use of shakey camera work, as opposed to the polished mainstream auteur approach of Kubrick. It certainly didn’t fit into the 1970’s “Horrality” (horror + hilarity). The Shining as such seemed to slip between categories: high art and low culture, subversive yet utterly contained, American studio film but with European sensibility. Thus it was destined, at the time, to please no one. Although Stephen King still maintains his dislike of the film (thinking a more ‘everyman’ should have been cast instead of the immediately unnerving Jack Nicholson) most critics have come to view this film as a masterpiece in tension and fear. Perhaps Stephen King still has sour grapes, after his screenplay adaptation of his own book was rejected by Kubrick. But his sequel is coming out, and a such he has been quoted as saying he hopes this will encourage fans of the film to read the original novel. The themes and metaphors within the film are vast; many of those I have read in the preparation for this review were commented on by the Film Clubbers on the night itself. They include 1970s paranoia, collapse of the family unit, fear of children and satire of patriarchal authority. There is the sense of loss of masculinity, duality (often literally shown by Kubrick in the use of mirrors) and the emerging revelation of the insidiousness of domestic violence. In Freud’s writing “The Uncanny” he describes how the homely can harbour the strangely unhomely and become a place of terror and alienation rather than security and identity, and how fathers are punitive and devouring. The Shining is Gothic horror in plain daylight. Kubrick continually warps the space of the Overlook Hotel as demonstrated in this fan made documentary. A good example is where in the first scene we are clearly shown the corridor running down the hotel, before Jack walks into Ullman’s office, lit by a posterior window that just couldn’t exist. This Gothic labyrinth won’t need darkness and shadow; you will get lost under bright lights and in straight corridors. Did anyone notice the carpet pattern change direction in this key sequence? Not continuity errors, but all planned and detailed by Kubrick himself. I wont delve into the millions of conspiracy theories that internet geeks are mad on regarding hidden messages of the film, such as Kubrick apologizing for his role in helping fake the moon landings. As this mammoth review has shown there are too many genuine things to be interested in. But, do feel free to make up your own minds on such things by searching on Google. Anyway, all Tuesday Review and no play makes Jack a dull boy. So I’m off to exorcise my flatmate and sacrifice a goat. Until the next time. When you come in here and you hear me typing or whether you DON’T hear me typing, or whatever the f**k you hear me doing; when I’m in here, it means that I am writing the Tuesday Review. THAT means don’t come in. Now, do you think you can handle that?